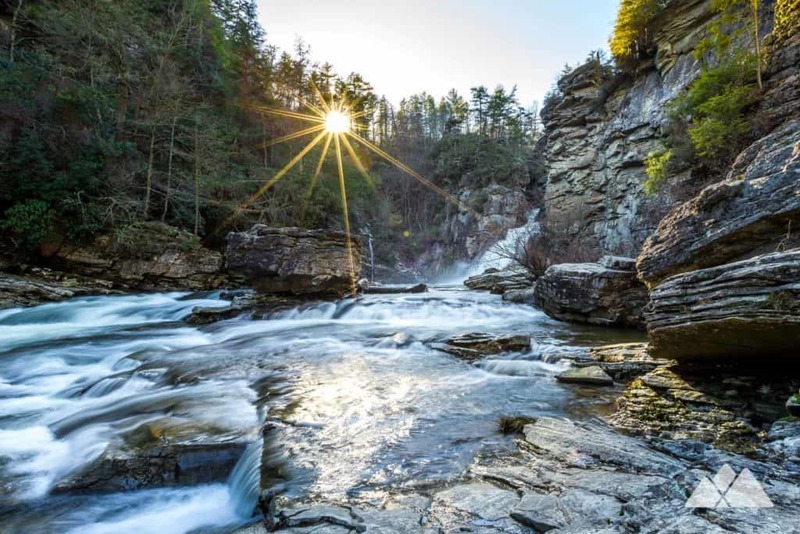 Hike from the winter-access trailhead at Linville Gorge, catching views of the tumbling Linville Falls waterfall from multiple overlooks, and plunging to the base of the gorge on the Plunge Basin Trail.
? Your mileage may vary! Accuracy of your GPS device, weather conditions, and stops along your route will affect your own recorded distance. 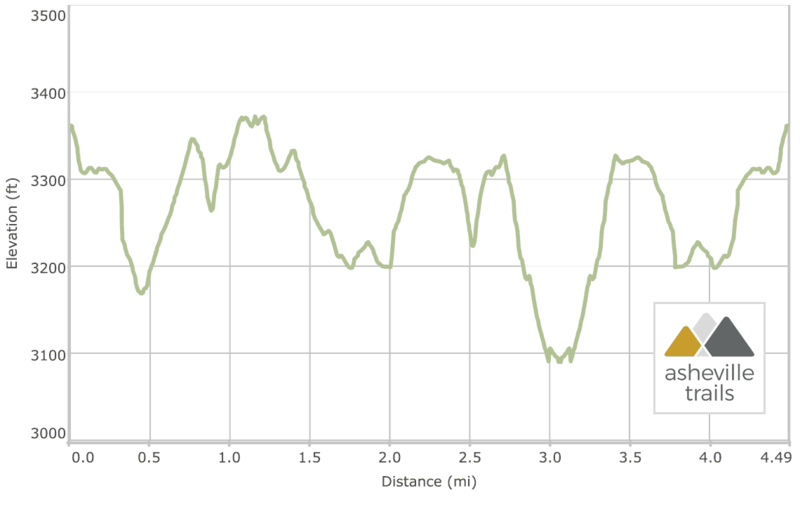 ?Our difficulty estimate, based on distance, terrain, elevation change, & ease of wayfinding. May vary daily due to weather, trail reroutes, downed trees, etc. ?Leashed dogs are allowed on this trail. 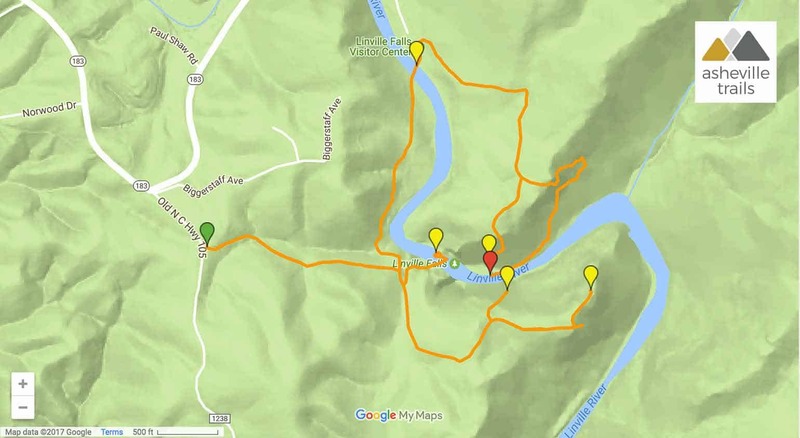 We’ve loved hiking this route with our trail-loving Labrador Retrievers! 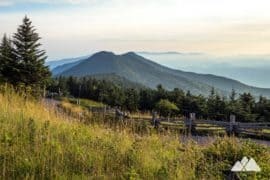 Check out more of our favorite dog-friendly trails near Asheville for a great hike with your pup. 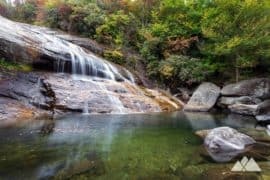 The tumbling cascades at Linville Falls are just stunning, and score a solid spot in our favorite waterfall hikes near Asheville. 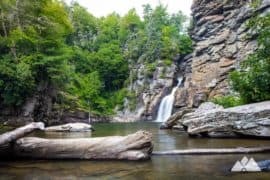 At the entrance to the epic, 2,000-foot-deep Linville Gorge, the gorge’s namesake river tumbles in a series of three gorgeous, photo-worthy waterfalls. 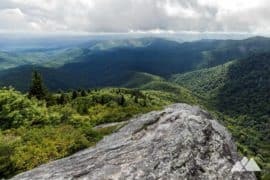 In warm-weather months, the Linville Falls Trail and Plunge Basin Trail are, without question, some of our favorite hikes off the Blue Ridge Parkway near Asheville. 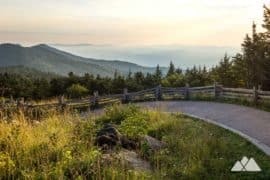 But in winter, the Parkway is often closed, due to ice and snow. In the mood for a great winter waterfall hike? There’s an alternate access to these waterfall trails from a gravel lot that’s maintained by the USFS. 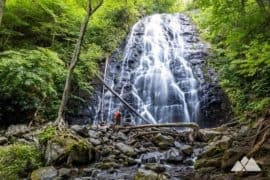 This waterfall-filled hike explores three towering overlooks, catches an up-close view of the upper waterfalls, and plunges to the gorge floor on the Plunge Basin Trail to explore the waterfall’s whitewater-filled basin. The hike demands some extra caution in winter, especially if there’s ice or snow on the ground. But the falls are particularly beautiful in cold weather, framed in frost, bright blue skies, fragrant balsam fir trees and dangling icicles. 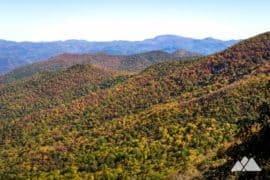 It’s one of our favorite winter hikes near Asheville – and it’s a great alternate route to the waterfalls, even when the Blue Ridge Parkway is open. The hike departs a trailhead off the USFS gravel parking area off NC 183 (view maps and driving directions), hiking eastbound from the parking area. The trail begins a steady (and often muddy) descent to Linville Gorge, dropping elevation alongside a small creek. 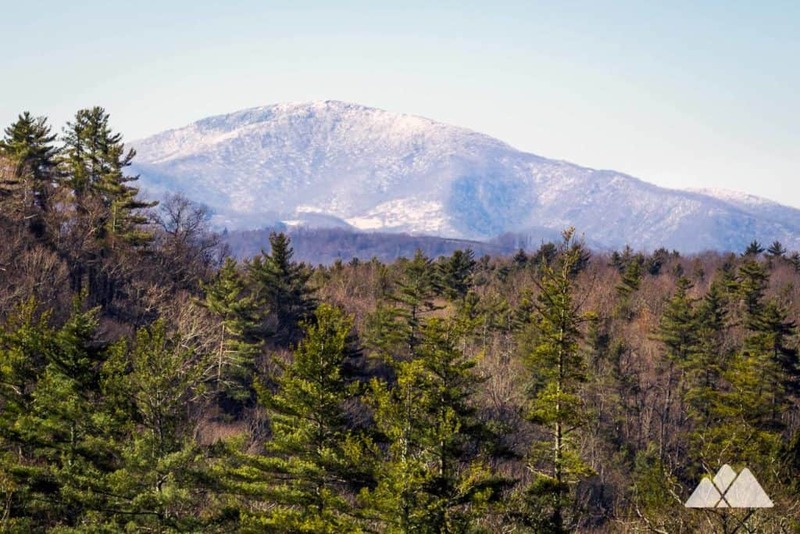 Though it’s chilly, the forest is vibrant and colorful: green moss covers rocks and downed trees, evergreen trees dot the deciduous forest, and leathery-leafed rhododendron thickets offer a wintertime dose of green. 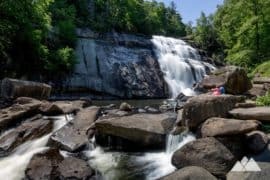 The winter access trail reaches the main Linville Falls Trail at .3 miles, hanging a left to hike southbound. The route quickly takes a left to explore the upper falls overlook, descending along a blocky cliff. 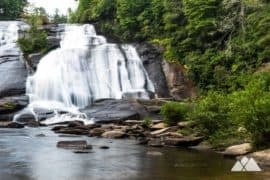 The trail ends on several wide, relatively level rock outcrops, offering exceptional views of the double-cascading upper falls and deep-cut channels above the lower falls. The hike departs the upper falls overlook, doubles back to the main trail, and turns left. 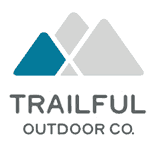 The trail courses through a wide arc, climbing elevation through a grove of fragrant, broad-trunked hemlock. The hike hangs a left near the crest of the hill, descending on a side trail to the Chimney View overlook. 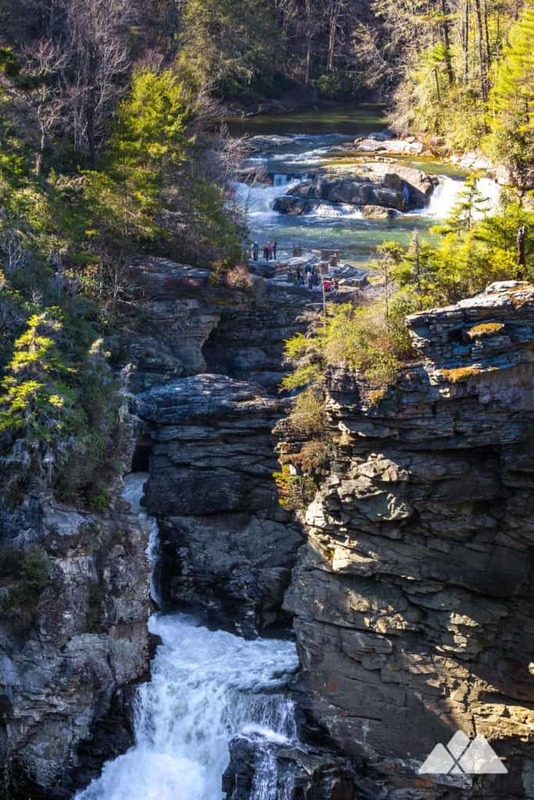 Chimney View’s high elevation offers excellent views of Lower Linville Falls. Hikers on the upper falls overlook offer a sense of the waterfall’s immense scale. Departing Chimney View, the hike doubles back to the main Linville Falls Trail, hanging a left to hike to the third waterfall overlook. The trail resumes a steady climb, gaining elevation. 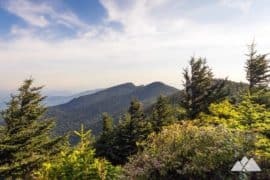 The trail reaches a side trail to the Erwin’s View Overlook, following the trail to catch long-distance views of the lower falls and cross-gorge views of evergreen forest and snow-capped mountains. 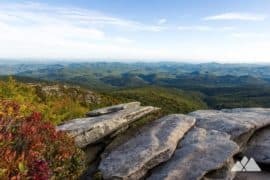 The hike departs Erwin’s View overlook, doubling back on the Linville Falls Trail and passing the spur trails to Chimney View and the upper falls overlook. 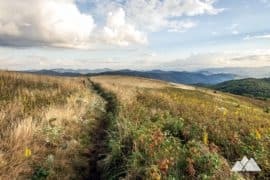 The trail reaches the USFS winter access trail at 1.6 miles; from here, optionally hang a left to hike westbound to the trailhead parking area, completing the hike at just under 2 miles. 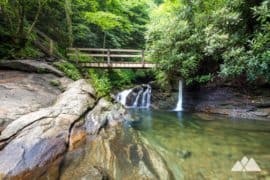 There’s a whole lot more winter waterfall beauty to explore, though, so this hike continues following the trail northbound, rolling elevation alongside the Linville River and crossing the river via a bridge at 2 miles. 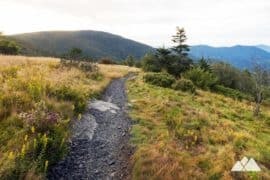 The hike passes through the visitor center breezeway, and then takes a right in front of the visitor center, beginning the hike on the Plunge Basin Trail. The trail veers to the southeast, rolling elevation through a forest filled with rhododendron. The trail levels briefly, just before reaching a side trail to the Plunge Basin Overlook at 2.3 miles. The hike descends to the overlook, catching up-close views of the tumbling lower falls. The hike retraces to the Plunge Basin Trail, continuing its journey to the gorge floor. The trail descends a set of steep wood stairs before switching back to the south, passing under a towering, steep-walled rock outcrop. The hike reaches the Linville Gorge floor at 3 miles, catching a frosty winter view of the whitewater-filled Plunge Basin below the lower waterfall. Departing the Plunge Basin, the hike flips in reverse, retracing its outbound steps on the Plunge Basin Trail and making a nearly unrelenting climb to the gorge rim. 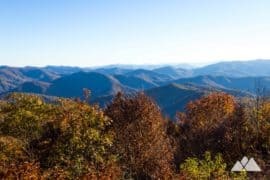 The steady climb is a great workout, and it’s pleasant in colder Winter months, especially compared to the heat of the summer. The hike reaches the visitor center at 3.75 miles, doubling back through the breezeway and over the bridge. 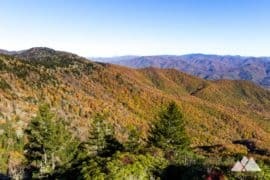 The trail hikes downriver and reaches the winter spur at 4.2 miles. 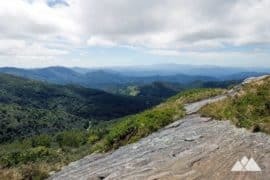 The hike turns right, climbing the winter spur trail to return to the USFS trailhead, and completing the hike. Note: slippery rocks and fast moving water can be extremely dangerous! Please don’t climb, stand on, swim near, or jump from any waterfall. Explore the gorge’s exceptional beauty throughout the year. 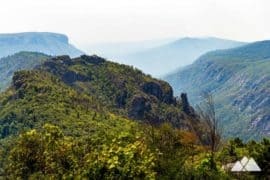 Our Linville Gorge Adventure Guide covers our favorite hiking trails and camping spots in this ruggedly beautiful outdoor wonderland. 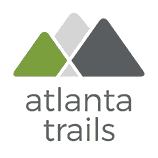 Trails and routes may change – so please refer to official trail maps for the latest route. 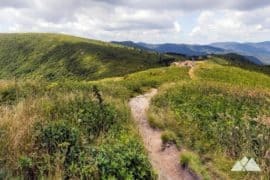 This trail is maintained thanks to the hard work of countless volunteers and donations from supporters of the Southern Appalachian Wilderness Stewards. Please support them by making a donation or joining a volunteer day. 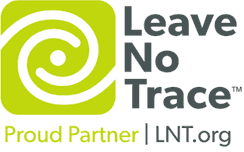 Let's work together to keep these fantastic trails maintained and open for use! Did you have trouble accessing the trail, or notice some recent trail updates or storm damage? We'd love to know! Contact us here, and thanks for helping us keep this site updated! 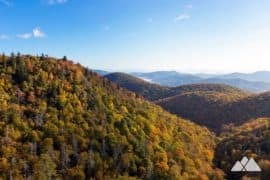 Free parking is available at the USFS trailhead, accessed from a gravel road off HWY 183 in Linville Falls, NC. 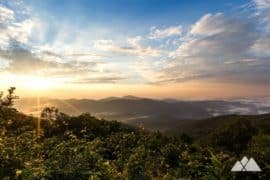 Eric Champlin is a writer and photographer who loves to hike, run, backpack, kayak and cycle the southeast. 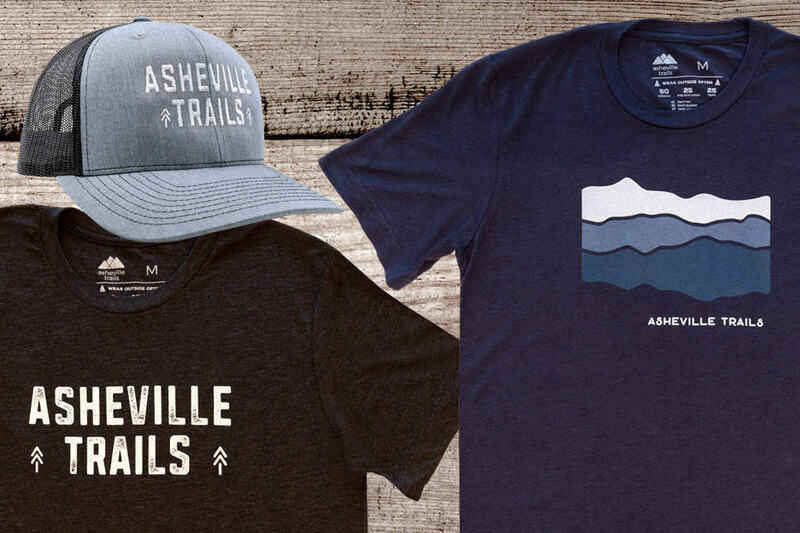 He’s the editor and founder of Atlanta Trails, Asheville Trails, and Trailful, digital magazines that highlight the South’s best outdoor adventures and top Southern-worthy outdoor gear. His mission? 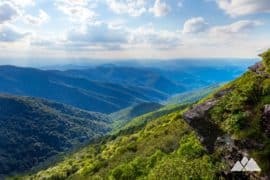 To inspire others to get fit outdoors and explore the South’s incredible scenic beauty.